Thankfully, here in Milwaukie at Anderson Family Dental there’s a simple and permanent way to fix tooth loss and restore functionality while also preserving a natural-looking smile and current facial contours: dental implants. 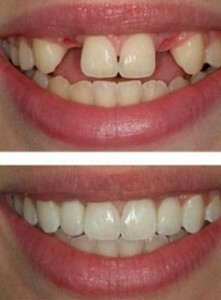 They are a more long-term alternative to dental crowns and/or bridges. Aesthetics – With no caps or bridges, dental implants look and function just like ordinary teeth. No one will be able to tell the difference when you flash your complete smile! Confidence – And speaking of complete smiles, what better way to give your self-esteem a boost than to fill in unsightly gaps with a dental implant? You’ll enjoy better comfort, oral function, and appearance without having to worry about constant maintenance or care. Is a dental implant for you? Contact Anderson Family Dental today for a friendly consultation!